A gratitude jar can be a great way to remember what you are thankful for. I know that sometimes the different roles you play in life may have you so busy until it seems like you just don’t have the time to stop and sit for a second. I encourage you take a second and sit and think about the good and blessings in your life. Your life will be so much better, I know mine is. I am also working on (finding) no making time to do just that. I have improved in this area but I am still a work in progress. In a previous post, I discussed how to start your day off with acknowledging and appreciating what you do have. It does help start your day off GREAT! I was searching the web and the gratitude jar caught my eye. You write down things you are grateful or thankful on a piece of paper and put it in the jar. Pick a specific time to read the notes you put in the jar. So, I decided to make one for the family. I got a mason jar that I already had at the house, got some ribbons and letter stickers from target and that was it. In family discussions, my kids do acknowledge their blessings but adding more ways to get them to participate in this will only make them more aware of them. Kids can sometimes forget lol. Well, adults can sometimes forget too. I have been guilty lol of that. 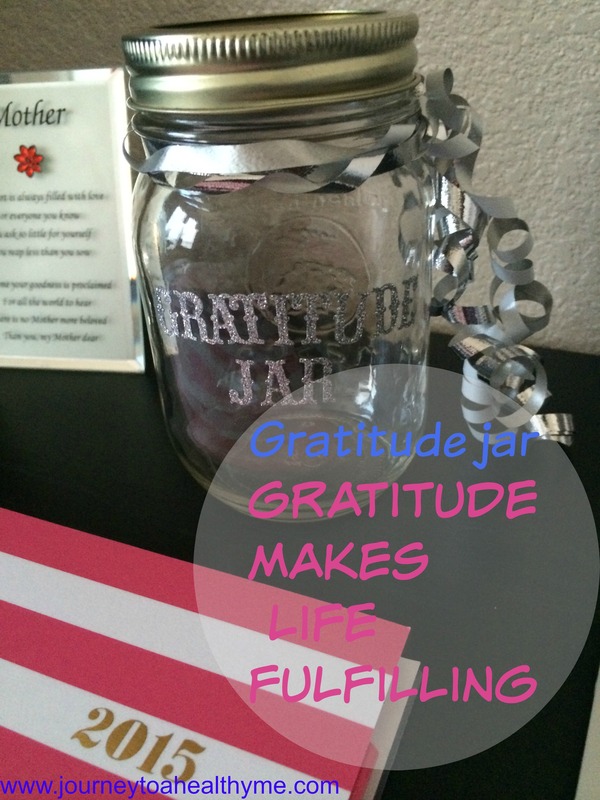 This gratitude jar will help eliminate room for negativity in my family’s life as a whole. As I move along this journey towards a healthier me, it not only helps my life but my family as well. I incorporate whatever improving I am participating in their lives as well. What are some ways you participate in to acknowledge gratitude and thankfulness? I would love feedback. This has been shared on TheoCentric Thursdays. Such a great reminder. My family an I have something similar to your gratitude jar. I can honestly say that it gives us a more focus. Thank you for sharing this!! I love this! I tend not to focus on the things I have to be grateful for in life. It definitely makes each day happier. Love it. Whenever I need a lift, I just have to think of something to be grateful for. We have a “thankful” jar as well that we bring out for Thanksgiving, but why not have one for everyday? Great idea! What I’ve been doing lately that has really made a big difference for me, is starting my prayers at night with thanksgiving for everything that was good about my day. I find myself looking forward to thinking of all the good things. Only after I do that can I ask for anything. 🙂 It has made a real difference in my attitude. Hey Leslie, thanks so much for stopping by with words of wisdom as I think that is a great way to end the day. What a great idea! To write down sometimes makes us realize things more easily! Thanks for sharing! I remind myself a lot of all that I have to be thankful for! All you have to do is watch the world news to realize how lucky we are that we live in a country where we are free! Hey Jamie, thanks so much for stopping by and I totally agree about watching the news. It will definitely make us think about how privilege we are. I should make one of these jars. Maybe I would be more intentional about gratitude. It has definitely been helping me. Thanks so much for stopping by. You’ve probably already done this, but I’m dropping in to #TheocentricThursday participants this week and leaving links to who they are supposed to comment on this week to make sure everyone understands how it works. It works best for the host’s record-keeping if everyone clicks the links on the actual blog hop, but when it comes right down to it, we’re more concerned with everyone receiving at least two comments per week! Entrants are only eligible for featured post status if they follow the rules of reading commenting on the two posts they are assigned. Love this gratitude jar. I just shared my feelings on how each day we can say “This is going to be the best day”. It is so true when we reflect on all the good we have we feel happier more joyful! I know this comment is late but I had to say that I love this idea. I have a little book of rememberance (like a mini diary) im supposed to write something in it everyday. But I forget. I like how visual the jar is.